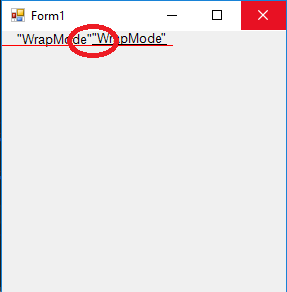 As a workaround, you can set the "WrapMode" property of "Label" to "No Wrap". It helps in this case, but does not in another. This is the design behavior of RTL text. You can see the observe the difference by zooming the viewer. Also, Alignment of RTL text in the exported file is correct. First, the text is not RTL-text, but it is aligned to the right. Secondly, it works fine in AR2 COM. Thirdly, I do not have the privilege to tell all our customers that this is by design. I hope this is not so difficult to fix this behavior. P.S. Distortion only in the first line. I have forwarded the request to our development team(ID 260669) and will inform you once I get any information from them. As per developer comment, the results depend on DPI of system. 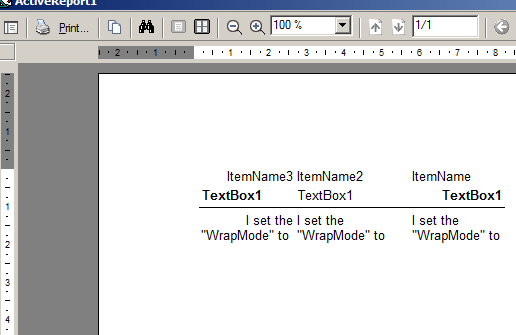 As WinViewer shows the text via the common System.Drawing API(GDI+), however, AR2 COM uses old GDI. Hence, this is the design behavior of the AR. 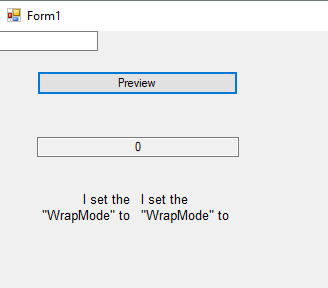 GDI+ works fine in the System.Windows.Forms.Form. It is AR12 issue. Yes, this is the issue of AR12. However, this is treated as the limitation of AR. You can fix this limitation. I have forwarded your request to our developers' team. Could you please try after setting the "CharacterSpacing" to "0.1"
After setting "CharacterSpacing" to "0.0001" of the point, it works perfectly vertically, but the text is cropped horizontally (calculated using "CharacterSpacing" 1). Could you please check it again after deleting the textbox and drag and drop textboxes again? 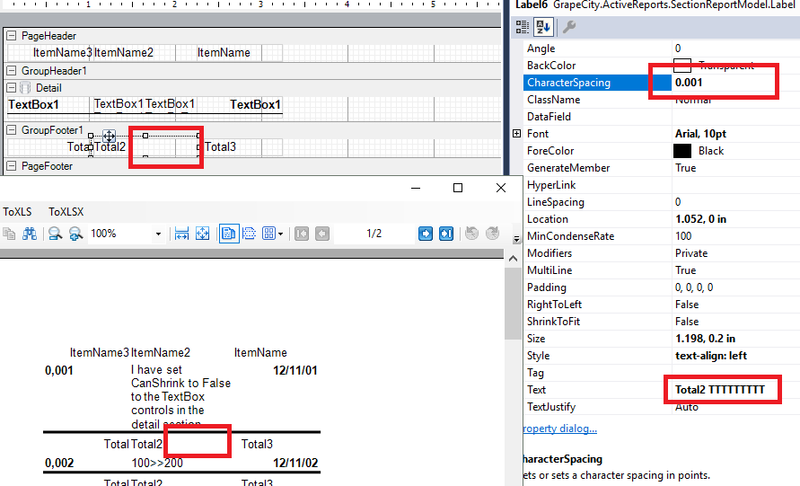 In my sample the text is not cropped horizontally when "CharacterSpacing" is setting to "0". 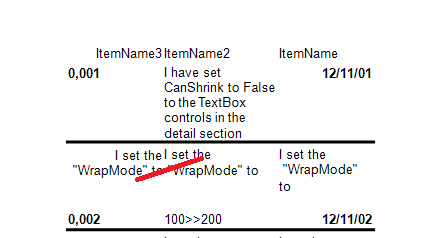 As a workaround, could you please set "WrapMode" property of "Total 2" label to "No Wrap"
CharacterSpacing may lead to the wordwrap because word's width is increased, but it is expected behavior. for the small values like '0.001', the length of whole string may grow to 1px and you need to set the control width with 1mm precision to see the different wordwraps in comparing of '0.001' and '0' values of CharacterSpacing property. 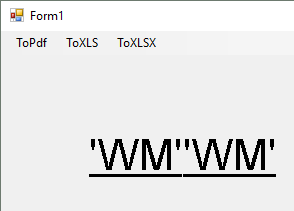 Because the CharacterSpacing may lead to the wordwrap because word's width is increased, your workaround does not help in cases with small text. 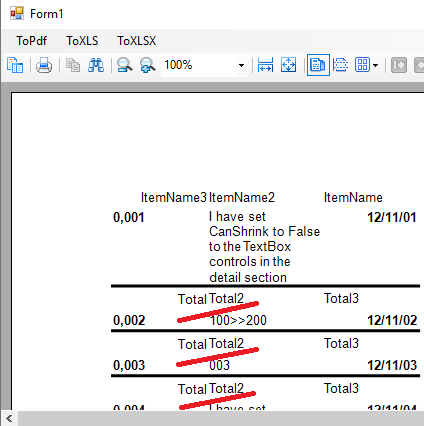 To view text in my sample properly i need to increase the width by 0.08 inches (2 mm), which is too much for aligning the text. I have forwarded your issue to our developers' team. ActiveReports uses the same API in WinViewer control. Your code works fine in Form, but WinViewer control looks garbled. Maybe, MicroSoft will fix this issue within the next six months.